I feel like this post says it all. It's my birthday!!! 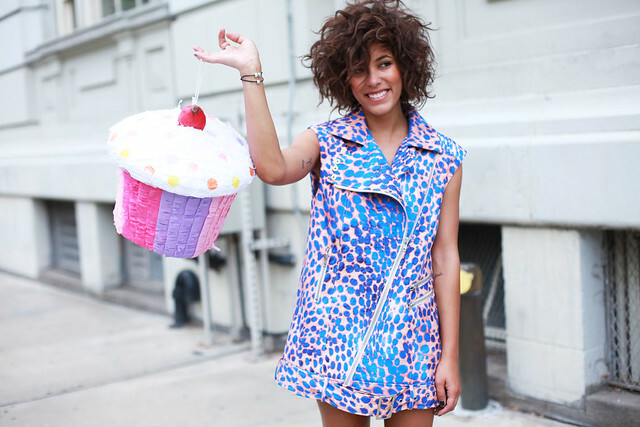 I mean could I be chees'in any harder holding that giant cupcake? I can't believe I'm already 26 years old!!!! Man time has flown by. I feel like this past year I've grown so much and discovered who Christina Caradona is..I feel like I have so much more to learn about myself and it gives me the chills to think that I have yet to meet so many more people and hear so many more jokes...I don't have any jokes left I'm all out!!! Decided to start off this new year in a new dress and new jewels. When I turned 13 I was given a charm bracelet and with the obsessive behavior I had and ...still I became crazy about charms. Being 13 I was naturally crazy about anything but charms were "my thing" and I had quite the collection so in honor of my 13 year old self I decided to wear my PANDORA bracelet from the Star Sign Essence Collection. If you follow me on my Tumblr or Instagram then you know I'm really into astrology so it makes sense my beads reflect my personality . I only have three for now : My Sign (Cancer) and it's values Trust and Health. Since it's my birthday and all and the birthday girl gets what she wants, PANDORA and I are hosting a giveaway! It's super easy to enter! All you have to do is follow PANDORA on Instagram & leave a comment below with your sign! Winner will win a bracelet with their star sign and two corresponding charms to match their sign! I really live in this bracelet because of how easy to wear and stackable it is. Congratulations to Nikki You are the Pandora winner!! Happy Birthday beautiful! I'm a Taurus! Happy Birthday my fellow Cancerian!!!! Happy Birthday, love the Cameo dress. Btw, your outfit is great! Happy birthday! I hope you enjoyed your day, that jacket-dress is so amazing! Loving this vest as dress. Gorgeous!! my birthday is in 2 days so i'm a Cancer as well!! :) happy birthday!! I hope 26 is a great year for you! I'll turn 26 later this year. I followed Pandora on Insta (as Wallace_Dee) and my sign is Scorpio! So beautiful, great birthday look! Happy Happy Happy Birthday beautiful, wish you nothing but the best!!!!! Oh - I'm a Gemini! Happy Birthday! I'm an Aries! That vest/dress is the coolest ever! Happy Birthday! I'm an Aquarius. Happy 26th Birthday!!! You look beautiful in your Cameo The Label dress! I hope all of your birthday wishes come true. Happy birthday! ! I'm Scorpio sign! !! I'm a Gemini. I would be so happy if I won! I'M FROM CHILE AND I´M SCORPIO!! Happy Birthday! Mine is tomorrow! :D I'm a Cancer! Happy birthday to you! My star sign is Scorpio! Happy Birthday fellow Cancer. My birthday is Sunday! !! Love it! I am a Leo and it fits me to a T! Happy Birthday and many more!!! Hope you have an amazing birthday!! My sign is Virgo!! Happy Bday!! Enjoy it!!! I am a Leo! Happy Birthday! I ADORE your hair! Happy Birthday! I am a Gemini. I'm already following Pandora on Instagram. I'm a Cancer :) Have a wonderful day! P.S. Your second picture is amazing! Happy birthday! My sign is also cancer ;D and I LOVE Pandora!!! I'm a Gemini. close to being a Taurus though. almost a cusp. coz Gemini starts on either May 21 or 22 depending which horoscope u look at. but aren't there 13 star signs now, what the 13th one again? Happy Birthday ~ Enjoy it to the fullest! Marcy Lackey here! Taurus! Happy Birthday!! Im a cancer as well:) happy birthday! Happy birthday!!! Gemini is the sign..
Hope you have an awesome day with lots of fun, friends & love. HAPPY BIRTHDAY!! I am a cancer. Happy birthday!! Im a libra! Happy birthday !! Hope you had a great day. My sign is Scorpio . Happy Birthday! I'm a June baby, too...June 11th! Happy Birthday! :) You look stunning! Happy birthday to you! I'm a Scorpio - need the bracelet to match my tattoo! Happy Belated Birthday, Christina! I'm following Pandora on Instagram as @goodnaijagirl, and I'm a Gemini—our birthdays are exactly a week apart (mine was on June 18!). My Instagram is JEN5TARRR and my sign is Aries. Happy birthday! My star sign is leo. Happy Birthday!!! Just had mine last week!!! I am a Gemini!! Happy birthday! I'm a Taurus. Happy Birthday!! Followed on Instagram! I am a Virgo! I love Pandora bracelets and charms! Happy Birthday and my sign is Aries. Thank you for the chance. Happy Birthday to you! I'm Sagittarius . Gemini! Thanks for the opportunity and Happy Happy Birthday!!!! Happy Birthday Sweets, looking fab Good Luck - SAG woman ! Love the pics! I am a Sagittarius ... Thanks! Happy Birthday. I'm a Scorpio. Happy Birthday!! I'm a Sagittarius. Happy Birthday! Many happy returns of the day! Best wishes! I hope you had a great birthday! I am a Gemini! Happy Birthday!! Followed on Instagram! I am a Leo! I love Pandora bracelets!!! My star sign is Sagitarrius. Lovely!! I must say you are my favorite!!! Always so effortlessly chic. Happy Birthday my fellow Cancerian! I wish you a Happy and Healthy Birthday. Hi my name is Cecelia and my Birthday is August 1st which makes me a leo. This would most defiantly be an awesome Birthday gift for me as well. I Love Pandora. Happy birthday girl, Gemini rocks! Happy Birthday! I love the giant cupcake photo! I would have taken lots of me pretending to eat it. heheh. :) Hope you had a great day. HAPPY BIRTHDAY, I am aries!! Gemini (but technically a Taurus-Gemini cusp). Your outfit looks beautiful like always. Especially the Pandora bracelet, the essence collection looks amazing! Sagittarius, and I'm @bunniker on instagram. Happy Birthday Christina! Love, love your blog!! Happy Birthday Cristina. Your design of essence bracelets looks interesting !